- The Iron Man design mouse are shiny ergonomic design to make do work and play games better-by allowing you to perform more action and more easily and by responding more quickly and reliably than standard mouse. - Every feature is designated to make work & games fun by making the way you control them more intuitive and more powerful in a more comfort and durable way. - Ultra-strong and durable, Gaming & Work adjustment, Comfortable palm feeling, Relieve tired, etc. - Sensitive data transmission without delay, responding more rapid and reliable. Scroll of this mouse convenient for browsing web and file. - Curve design with comfortable materials, which fits your hand perfectly and naturally. Therefore, you will feel less hand fatigue for long time use. - The ergonomic glossy shape design plus scroll wheel and skin-friendly surface provide you the most comfortable feeling in hand for long time. - The Iron Man gaming mouse eye different colors changing glaring LED light, Blue colors are glowing at once, highlights the atmosphere of gaming. 4 Adjustable DPI: - 1000-1600-2400-3200/4000-5500-6800 DPI Resolution Optical Tracking Technology provides sensitivity and precise tracking on a wide range of surfaces. 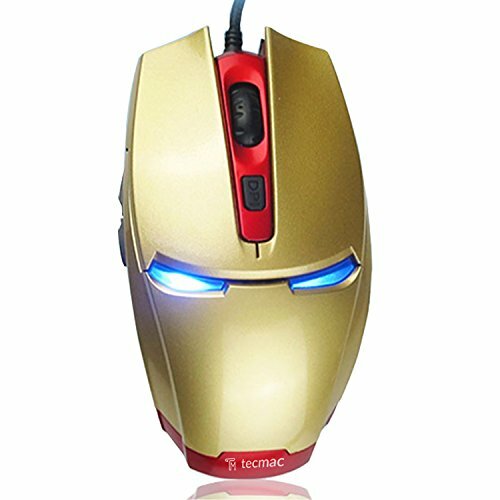 Amazing LED Lights: The Iron Man gaming mouse eye changes randomly different LED color schemes, creating amazing feelings for gaming or working. The lights is soft so that it will be not distracting when you are using it. Easy to Operate: Every key's functions are all described in the pictures. you can press any key to wake up the mouse when the mouse in the power saving mode. 6 Buttons: The 6 Buttons are including left button, right button, scroll wheel, DPI key, page forward, page backward. Comfortable Device: The mouse has an ergonomic design to make you having a better experiences and feelings. Forward and Backward Button: Enjoy quick browsing of your favorite webpages or surfing throughout documents via the backward and forward buttons, located conveniently under your thumb. If you have any questions about this product by tecmac, contact us by completing and submitting the form below. If you are looking for a specif part number, please include it with your message.